John Alletto, 37, is charged with a felony hate crime and aggravated battery. 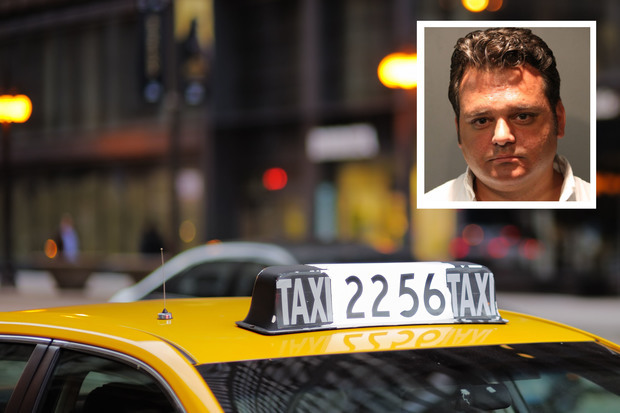 COOK COUNTY CRIMINAL COURTHOUSE — A suburban man is charged with a hate crime after he walked up to a Chicago cab driver, asked him if he was Muslim and then beat him when he responded "yes," prosecutors said. The driver was stopped at a red light near Division and Larrabee streets about 3 a.m. Feb. 21 when 37-year-old John Alletto walked up, opened the driver's door "and asked if he was Muslim," prosecutors said. The 42-year-old driver replied, "yes," and Alletto began to punch the man in his head, neck and body, Assistant State's Attorney Lorraine Scaduto said during a bond hearing Wednesday. At that point, the driver's passenger got out of the cab, prosecutors said. When a witness approached, Alletto yelled out that the driver was Muslim, according to Scaduto. The witness said it was racist to attack a Muslim and called Alletto "a racist," Scaduto said. Alletto then turned toward the witness, and the two began to fight, according to prosecutors. Police later described Alletto as someone who "appeared highly intoxicated," Scaduto said. Alletto, of southwest suburban La Grange, initially was charged in February with misdemeanor battery, court records show. Upon further investigation, prosecutors this week upgraded charges to include felony hate crime, aggravated battery in a public place and aggravated battery to a taxi driver. On Wednesday, Alletto's defense attorney called the attack "an anomaly" and an "isolated incident." Alletto has bipolar disorder, the attorney said, and had mixed his medication with alcohol in a moment of "ill-advised foolishness." Renner Larson, a spokesman for the Council on American-Islamic Relations, said Chicago's Muslim community has been on edge in recent months amid a rise in "the mainstreaming of anti-Muslim rhetoric." "Everybody in the community is concerned with what might happen," Larson said. "For cab drivers, you're interacting with a lot of people, and you're inviting anyone into your car." Larson said that many Muslim drivers are newer immigrants or people who come from working-class backgrounds — "as opposed to doctors or lawyers or engineers who may have more of a support structure in the United States." On Wednesday night, several Muslim cab drivers said instances of discrimination and hate speech are few and far between — but they do happen. Shafi Rahman once had a man yell at him to "go fast, or I'll report you to ISIS," he said. "I said, 'If you want to go to your destination, then shut your mouth.'" The man was drunk, Rahman said, and had jumped into the cab ahead of two women who flagged it down. Rahman, who's driven a cab for more than 10 years, tries to avoid harassment by avoiding drunken passengers, he said. Fauz Rafdeen could only recall being discriminated against for his religion and ethnicity once in 30 years of driving — and he couldn't remember what the man said. "Maybe I'm lucky," Rafdeen said. "Only once it happened. He was drunk. I took him right to the police station." Rafdeen said he doesn't know many Muslim drivers who have had serious problems with hate speech. Most of the problems stem from drunk people, which is a hazard of the job, he said. "They're drunk, so I don't know if I hold it against them," he said. According to prosecutors, Alletto's drunken February attack was captured on the surveillance camera in the cabbie's car. The Edgewater-based driver suffered swelling and bruising on his neck. Cook County Judge Laura Sullivan on Wednesday set bail for Aletto at $25,000. Alletto posted the requisite 10 percent and was free by Wednesday evening, court records show. According to his defense attorney, Alletto previously worked as an investment broker and "never had anything like this happen in his life." An arrest report lists Alletto's current profession as "self-employed musician."